A baby has had to be rescued in north Devon after getting locked in the bedroom of a first-floor flat. Firefighters said they rescued the child on Tuesday night after they got into the flat in Torridge View, Torrington, by using a ladder. 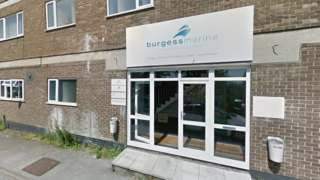 Burgess Marine is in administration after problems with payment for a "major refit project". A British car designed to reach 1,000mph - which has been trialled in Cornwall - will be tested for the first time on its South African dry bed race track in October next year. Bloodhound SSC will be tested at Hakskeen Pan, Northern Cape, with the team behind the supersonic car aiming for a 500mph milestone. The car is fitted with an EJ200 jet engine, which has been sourced from a Eurofighter Typhoon aircraft. In October, Bloodhound, driven by ex-RAF fighter pilot Andy Green, reached 200mph during trials at Cornwall Airport in Newquay. The team said the trials would test its performance and handling during one of its most vulnerable phases: between 400mph and 500mph. The dried-out lake bed is super-flat and extends for 12 miles (19km), providing ample space to get up to some very high speeds and then slow and stop safely. The team is aiming to go 800mph in 2019, and then up to 1,000mph in 2020. Nearly 150 cafes, bars and other businesses in Devon are offering free water refills to anyone who wants them. They've joined a scheme called Refill, which aims to cut down on the amount of single-use water bottles going to waste. Thousands of bottles end up in the sea every year, causing pollution and harming wildlife. Tonight will be dry and clear for most, although a few showers will continue in the west. Winds will ease after midnight, allowing a touch of ground frost in places by morning. Saturday is expected to be dry and sunny through the morning, but it will cloud over at times in the afternoon with some showers developing late in the day. 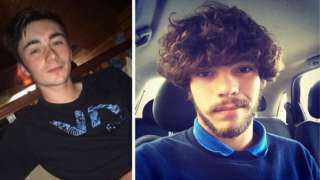 Police searching for a missing 15-year-old from Devon have extended their search for him around a river. Daniel Chambers, from Tipton St John, was last seen at his home address two days ago. He didn't catch his bus to school. It is believed he likes to visit Sidmouth and Beer. Officers said they were "becoming increasingly concerned" for his welfare and searches had been extended to include in and around the River Otter. Det Ch Insp Stuart Cavin, of Devon and Cornwall Police, said: "We are appealing to people who know and use the walkways around the River Otter, particularly between Tipton St John up to Ottery St Mary. "We know that Daniel used this area and we think he may well have been seen by many walkers and other members of the public who use these paths." He is described as white, about 6ft (1.9m) tall, slim, with short dark brown hair and clean shaven. He was last seen wearing dark-coloured chinos and a grey hoodie with horizontal stripes on the back. It is believed he is carrying a black rucksack with a green-coloured DC logo. Patients have been waiting in corridors and on trolleys at the Royal Cornwall Hospital on the outskirts of Truro because the number of people turning up at its emergency department has risen by 50% at times, staff say. A spokesman for the hospital said earlier this afternoon that it was back on its highest level of alert - level 4, formerly known as black alert - with very few beds available for new admissions. Director of patient flow Duncan Brown said there had been "overwhelming demand" and the emergency department had recently seen 60 to 80 patients in it instead of an average of 40 to 50. A lack of beds had also meant some could not be admitted into the hospital from the department. He said: "We have had people having to stay in the corridor, but it's certainly not the place we would like to keep our patients." In Falmouth, Avenue Road is partially blocked by an accident near Lansdowne Road, near the train station. A vehicle has left the road and gone into a wall. Some public toilets in Totnes are being closed over Christmas because of public safety concerns after continued drug use and drugs paraphernalia being discarded in them, a council says. South Hams Council said toilets at Coronation Road, Steamer Quay and the Civic Hall had been recommended for temporary closure because of "a minority of users in the town" from 20 December until after the new year. "This poses a very real risk to both members of the public and the people the council employ to clean the toilets," it said. The closures would be reviewed in January, the council added. A rare tropical turtle found washed up on a Cornwall beach had been "weak from its ordeal" before it died, an aquarium says. The Kemp's Ridley turtle, an endangered species, was being cared for by the Blue Reef Aquarium in Newquay after being found freezing cold and exhausted on Holywell beach last week. The aquarium confirmed on Friday it had died. It was believed to have travelled from its natural habitat near Mexico or Texas. Aquarium curator Steve Matchett said: "When the turtle arrived at the aquarium, it was very weak from its ordeal, plus we could see that there was extensive damage to the shell. "When turtles end up off course and enter colder waters, they can quickly become exhausted and are unable to feed as they get too cold. Cornwall's health watchdog is carrying out an in-depth survey on GP services so health commissioners can get a better picture of pressures in the system, it says. People were finding it increasingly difficult to access appointments, flagging up issues such as surgery closures or new housing putting pressure on appointment availability, Healthwatch Cornwall said. It said it hoped to use the results to help with planning new or alternative options. Amanda Stratford, from the watchdog, said: "The whole point of it really is to get that in-depth information to share with [commissioning organisation] NHS Kernow. It can take and use it in terms of influencing services. "There are fewer GPs, there are GPs retiring, and all sorts of pressures on the system." The government said it was putting more money into primary care and offering golden hellos to doctors for areas struggling with such pressures, such as Cornwall. The survey is open until 19 January. There have been calls recently for the motorway to be extended from Exeter to Plymouth. It currently finishes at Exeter, with the A38 then providing a dual carriageway route on to Plymouth. Plymouth City Council voted in November to press the government to commission an appraisal so the cost and timescale can be established. A senior Devon councillor who attacked his wife with a wooden mallet had been drinking Tia Maria and Polish brandy prior to the attack, a court heard. Sixty-seven-year-old Douglas Hellier-Laing, who has resigned from Teignbridge District Council, was jailed for three years for the attack in October during which the councillor hit his wife three times. Hellier-Laing, of Clifford Street, Chudleigh, pleaded guilty to wounding with intent to cause grievous bodily harm at a previous hearing at Exeter Crown Court. He said it was a "moment of madness", and described his drunkenness as a seven out of 10. Sentencing, Judge Graham Cottle said: "It is not really clear why you did what you did on that day in question." He added: "I would have thought drinking must have had something to do with the way you reacted and had you been sober you would have reacted in a different way." An injured tropical turtle which was found washed up on a Cornwall beach has died, an aquarium says. The rare Kemp's Ridley turtle was found by Dave Hudson, a conservation and biodiversity student from Exeter University, last Friday. It was being cared for by staff at the Blue Reef Aquarium in Newquay after being found freezing cold and exhausted. It was believed to have travelled from its natural habitat near Mexico or Texas. The shell of the turtle, an endangered species, had been damaged and it appeared extremely weak and dehydrated when it was found. The aquarium said: "Despite an encouraging initial response to treatment, the turtle's injuries were likely too extensive and the turtle too weak to fully recover." A senior Devon councillor jailed for three years for attacking his wife with a wooden mallet resigned from the local authority he worked on after pleading guilty. Douglas Hellier-Laing, 67, hit his wife, Susan, in the head three times before phoning police to confess. Mrs Hellier-Laing, 59, was treated for serious injuries after the attack on 29 October, Exeter Crown Court heard. Her husband, a cabinet member of Conservative-led Teignbridge District Council, admitted wounding with intent to cause grievous bodily harm. Hellier Laing, of Clifford Street, Chudleigh, was the executive member for economy, skills and tourism at Teignbridge District Council until resigning. The Royal Cornwall Hospital in Truro is on a level four alert - what used to be known as a black alert. It means it is effectively at full capacity. The Royal Cornwall Hospitals NHS Trust said it was taking action within the hospital, implementing its full capacity protocol, as well as working in the wider community to respond to the situation. Aaron Reilly and Joshua Brock had taken a mix of ecstasy and amphetamines, an inquest hears. 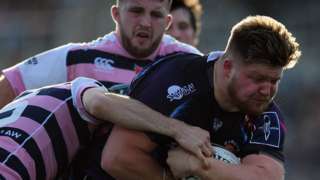 Championship club Cornish Pirates sign Exeter Chiefs prop Jack Owlett in a dual-registration agreement.